Today, some Eurobricks members started to report they have received the Service Pack to fix their 8043 Excavator problems. 1x Axle and Pin Connector Perpendicular 3L with Center Pin Hole (32184). 2x Axle Pin with Friction Ridges Lengthwise (43093). 1x Axle 3 with Stud (6587). Revised building instructions pages (41 and 45) from book 1. As previously explained  the new LAs have an identical look to their predecessors, but could be distinguished by their new production code, located just below the orange cross hole. According to the reported case, the code is 36X0. However I might check if this is an unique code (have my doubts), or if it will change over time as new production batches take place. The new LAs and modification, are reported to be effective. Lower friction LAs, smoother and faster boom lift, and no more problems driving tracks. Questions about the new LA design remain. What was changed? Has the internal screw pitch changed (meaning number of turns to run the full course)? Did the internal clutch suffered any changes? Does rod bends less when fully extended? It should not take too long, until we get answers for at least some of these questions. So it looks, soon we all be able to play and joy with the renewed beauty again. In the country where I live, the new 8043 boxes are expected to arrive at stores in the middle of October. How exactly can one ask for service pack? I've bought 8043 couple of weeks ago, and would like to ask for service pack (mainly because of revised LAs), I've tried to contact with Lego Customer Service (using email form), but with no answer... At least not yet. Maybe a phone call turns to be more effective. Guess you might have a free access number, for your country. I suppose their differences are like those between the two models of 9V geared motor: subtle yet present for those for whom they matter. @Jetro,@AVCampos: LEGO did the same with the defective PF IR Receivers recently. Corrected them and kept the new ones with the same appearance of the defective ones... the only difference is that the LED blinks shortly when the device is turned on. The PF IR Receivers were not exactly defective. As far as I remember there was a correction for one mode, never used by LEGO so far, and also an HW revision to include new features (additional working modes). I have the service bag. The only number I can see written on the LA is '61927', but this is also written on the older LAs! 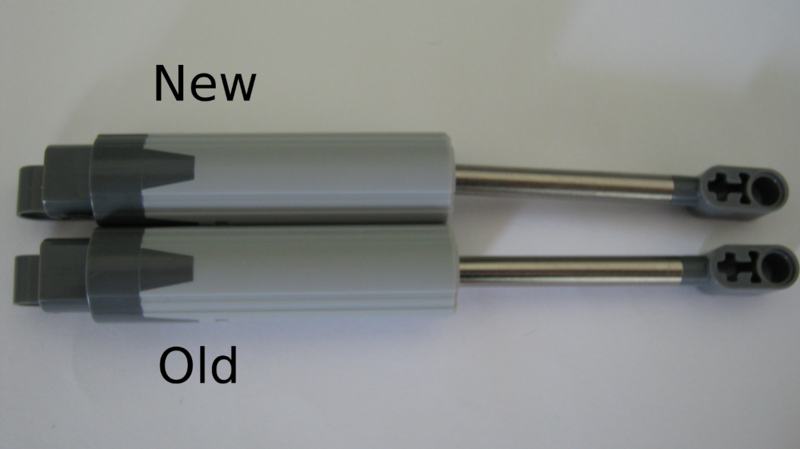 I have dismantled and compared an old and a new LA. The new LA still takes the same number of rotations to extend. It still extends to the same length. There is still a clutch. I have cut the white plastic sleeves into pieces to look at their teeth, and from what I can see, the sleeve is identical on both LAs. 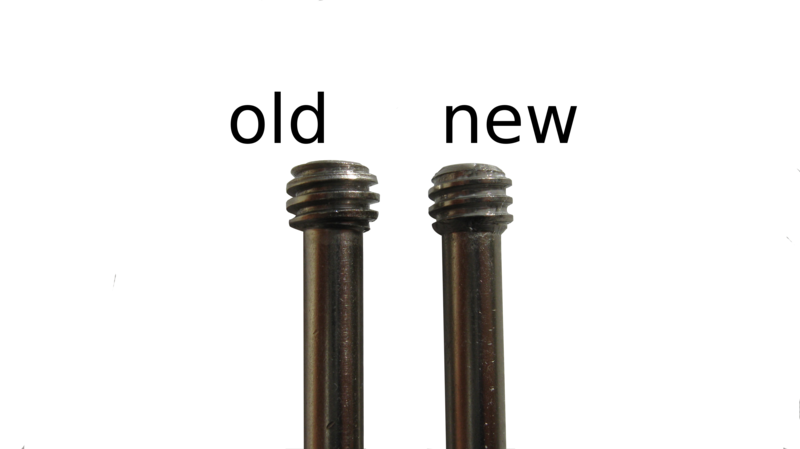 From the 1st photo, it seems there is also some grease on the screw from the new LA. But I guess it might be some lightning effect. I think it deserves a post of its own. Could I use your photos ant comments to write such post? Yes, you can use my photos and comments. I forgot to mention - there is a lot of grease in the new LA. Was there any grease on the screw of the older LA? I did not get chance to check this myself, because I was trying each LA's screw in the other LA's sleeve (to check that the sleeves were the same), so the grease got mixed between the two sleeves. Meanwhile I have posted this on eurobricks, along with two extra pictures showing the parts of the new LA which have the most grease. The original LA that I've opened two years ago, did have any grease inside. Don't know for those produced in between, but likely they haven't too. Could you please publish the instruction sheet inside the service pack? on the official web site TLC there isn't yet the book 1 of 8043.